Last night in front of an audience of hundreds at a presentation at the University of Southern California, TV personality Bill Nye — popularly known as the "Science Guy" — collapsed midsentence as he walked toward a podium. Early indications are that Nye is OK, but what's odd about the incident isn't so much Nye's slight health setback as the crowd's reaction. Or, more precisely, its nonreaction, according to several accounts. It appears that the students in attendance, rather than getting up from their seats to rush to Nye's aid, instead pulled out their mobile devices to post information about Nye's loss of consciousness. Alastair Fairbanks, a USC senior in attendance for Nye's presentation, told the Los Angeles Times that "nobody went to his aid at the very beginning when he first collapsed — that just perplexed me beyond reason." The student added, "Instead, I saw students texting and updating their Twitter statuses. It was just all a very bizarre evening." Indeed, a cursory search on Twitter revealed a virtual play-by-play account of the incident. One student wrote, "Bill Nye tripped on his computer cord while speaking at USC, was out for abt 5 secs, got back up, spoke w/ slurred speech and fainted." According to the school's student news outlet, the Daily Trojan, Nye asked, "What happened? How long was I out?" when he regained consciousness. Briskly picking up his humorous persona, he added, "Wow, that was crazy. I feel like Lady Gaga or something." Nye's publicity team didn't immediately respond to The Lookout's request for comment on the episode. Still, in the annals of the digital public's civic indifference, the Nye incident is nowhere near as disturbing as another episode reported in New Orleans earlier this week, which oddly enough also involved a humorist. Anthony Barre, a New Orleans man popular for his acid-tongued comic performances on YouTube using the handle "Messy Mya," was murdered on the streets of the city's 7th Ward — the historically Creole neighborhood chronicled in the HBO series "Treme." As he lay dying, witnesses at the scene took to the Internet to chronicle the tragedy in real time, even posting photos of his body lying in a pool of blood. This is how the world learned of Messy Mya's death. Prior to this week's episodes, perhaps the best-known incident of youthful digital passivity in the face of danger was the September 2007 tasing of University of Florida student Andrew Meyer at a speech delivered by Massachusetts Democratic Sen. John Kerry. That episode immortalized the expression "Don't tase me, bro!" The crowd of onlookers trying to capture the encounter on their cellphone cameras later prompted Comedy Central host Stephen Colbert to imagine the internal monologue of a bored-looking kid seated next to Meyer thusly: "He's thinking, 'I wish they'd stop tasing this guy, so I can get home and watch him being tased on YouTube.' "
UPDATE: A USC student who attended the lecture wrote in to contest the assertion that students in the audience were tweeting and texting after Nye fell. 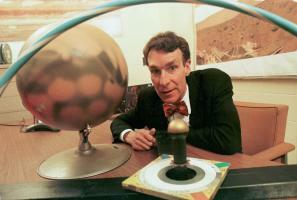 He writes: "When Bill Nye fell, he was only down for a very brief 5 to 6 seconds. During this period, everyone was so confused and shocked, we assumed it was part of the show and no one could have, or did, know that it was a medical problem. It was our childhood hero, we did not want it to be a medical issue. Everyone was so riveted and confused, NO ONE reached for their phone. We wouldn't even know what to say, we had no idea why he had fallen anyhow. The whole auditorium was silent and on edge, we were at once concerned and confounded. Once he came to, apologized for falling, and stumbled while grabbing on to the podium, everyone realized the awful truth and stage hands jumped to the stage to assist him."